As All American Pro Wrestling prepares for its biggest night ever (Main Event, January 14), I'm going to take a closer look at the matches set for the evening. I recently blogged about Colt Cabana and his match with AAPW star "3G" Eric Wayne. The two will put on one heck of a match. 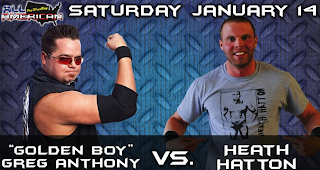 Another great match booked for the 14th features one of AAPW's most ruthless competitors (and I say that in a good way) "Golden Boy" Greg Anthony and the fast rising, ever popular Heath Hatton. To say this is a grudge match is an understatement. Quick back story here, Heath and Curly were the AAPW tag team champions and feuding with Golden Boy and his partner "Serial Thriller" Shane Rich. Just as Rich and Anthony were on a roll, Rich was hurt in a serious motorcycle accident. That left Golden Boy without a partner, and a huge chip on his shoulder. Somewhere along the way Heath also found himself without a partner, and even though he was approached by others in the AAPW locker room, he decided to go it alone and defend the tag team titles without Curly. I think Heath hoped Curly would make his way back to the company, but it wasn't meant to be. However, Heath did defend the titles in a handicap match against the much larger team of the Convoy. 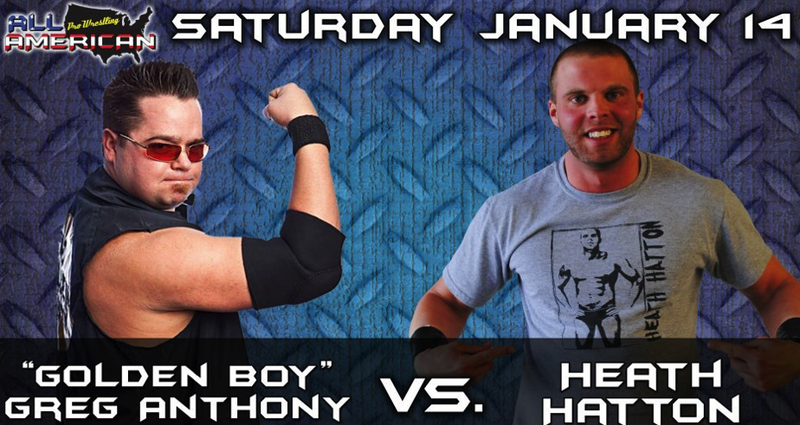 It was an impressive outing by Heath, proving to AAPW fans that he is indeed the real deal. On that same card, the Golden Boy came up on the losing end of a match in which he got pied. And not just once, but dozens of times by AAPW fans who got the sweet taste of revenge against the villainous competitor. But that outing may have sparked a fire deep within Golden Boy, as he would have another trick up his sleeve. Spoiler alert: On an upcoming episode of Collision, Heath defends the tag team titles against Matt Cage and Christian Rose. Again, Heath held his own and it appeared he was going to have another successful defense of the tag team titles. But that's when the underhanded tactics of the Golden Boy came into play. Long story short, he cost Heath and Curly the titles. Because of the underhanded tactics, AAPW Executive Producer Chris Hagstorm has now decided these two need to work out their differences in the squared circle. The two of them come into Main Event with a lot to prove. A victory for Heath put him on the path to singles stardom. But if Golden Boy gets the win, it'll give him unlimited bragging rights that he beat AAPW's fast rising star (and OVW newcomer). Join us at AAPW Main Event. Special bell time of 6:45 at the Black Diamond Harley Davidson Warehouse. Go to AAPW's website for ticket information. More match previews to come!